I have never owned restaurant, but I worked in one. I have never run a full-fledged marketing company but I have helped out more than a few. I work with a lot of food based businesses and while it is easy to be an armchair business owner or backseat marketing guru, I have formed some opinions on what works or does not work in the world of restaurant marketing and promotion. I have also watched every episode of Madmen. I see a lot of people who don’t do it or don’t do it well. Or they take a formula and try to apply it universally to all types of businesses. That doesn’t work. This is what does work, with trial and error, practice and determination and a bit of luck and timing thrown in. You need to know yourself. You need to have a passion about your product and business. You need to know your customers and the community you serve. If you do these things and keep at it, you just might market your business long enough to have a sustainable enterprise. 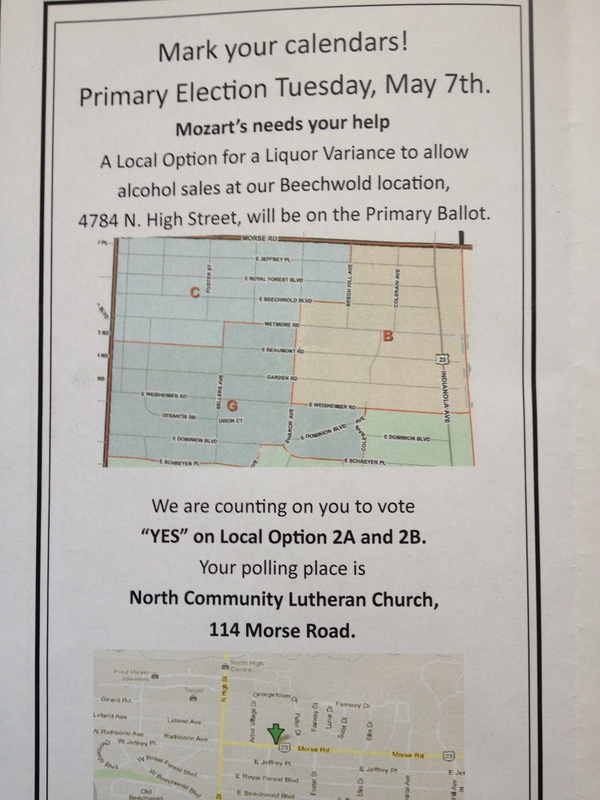 I wrote earlier about the May 7th vote to allow the new Mozart’s to serve alcohol in the Beechwold community. And I described how the owners and employees approached the community about doing this. They made their campaign personal and authentic and not too pushy or preachy. I predict (less than a day before we find out) that they will win. 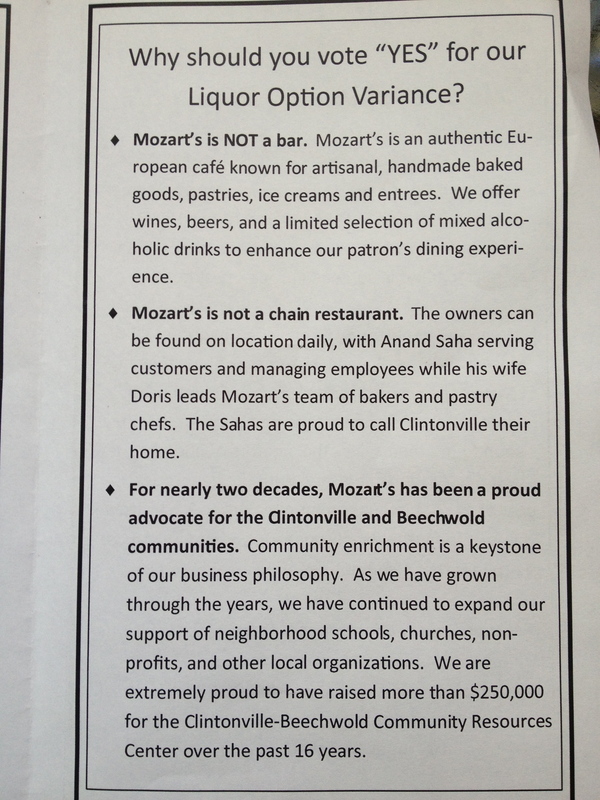 Why, because the community already wanted this outcome but the victory was helped because Mozart’s made their case. Below you will see part of the flyer that was on my door this past Saturday. The flyer was delivered by a person, not mass mailed. It did not offer a coupon or flashy graphics or claim the end of the world if booze does not flow in our community. Take a look and see how grassroots marketing can work. 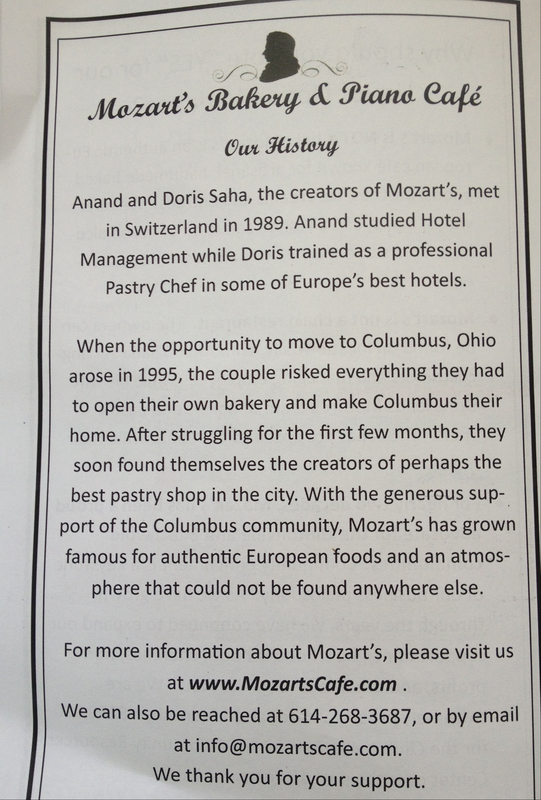 Page 1: Introduced the business and shows their history in the community. Sidenote: among the many past uses of this building was The Beechwold Tavern and many other long-term businesses. Page 2: asks for help and shows you how to do that…if you choose. Page 3: Who we are what is our place in your community. Page 4: The history and an invitation to find out more. My conclusion. Good job. In general, what helps a food business survive in the first year is to find a community (or tribe) that will support it. What helps a food business thrive after that is to stay connected to their community and to stay on the radar by supporting causes, little league teams, offering meeting space, showing up to events, helping other businesses and by being there when you are asked and even better when you are not. 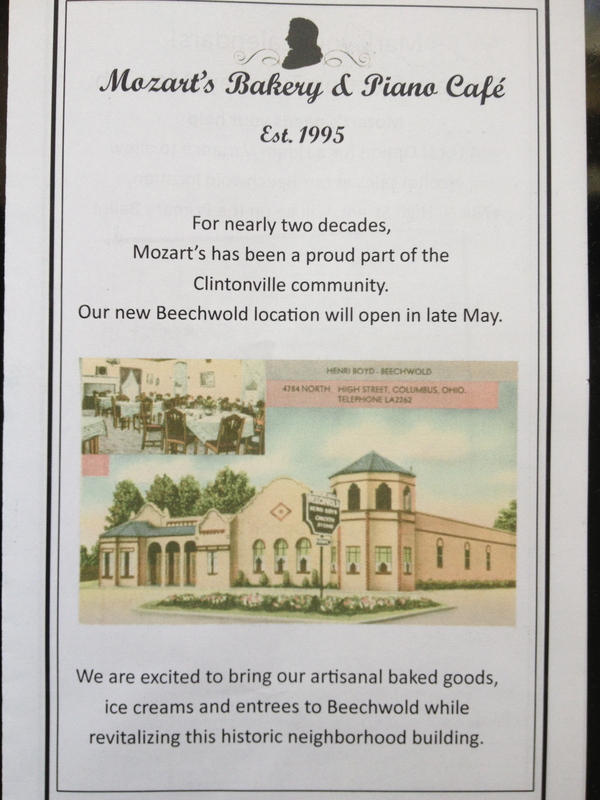 Best wishes in your new location Mozart’s, we appreciate your commitment to our community. This entry was posted on May 6, 2013 at 3:29 PM	and is filed under Clintonville. You can follow any responses to this entry through the RSS 2.0 feed. You can leave a response, or trackback from your own site. So much classier than the last attempt from the Scotties guy. It also may help that the precinct on the East side of High gets to vote, rather than the one to the west. CMH G. Reply: Agreed and Agreed. Hope if Talitas make a go for alcohol at the former Babuska’s, Scotties spot if that is still on the table, that they took some notes. Bummer. Not sure that is a better location.